Pythagoras (born in Samos, died in Metapontum), he is also known as Pythagoras of Samos, was a famous Mathematician from Greece, who lived between 570 BC and 495 BC. 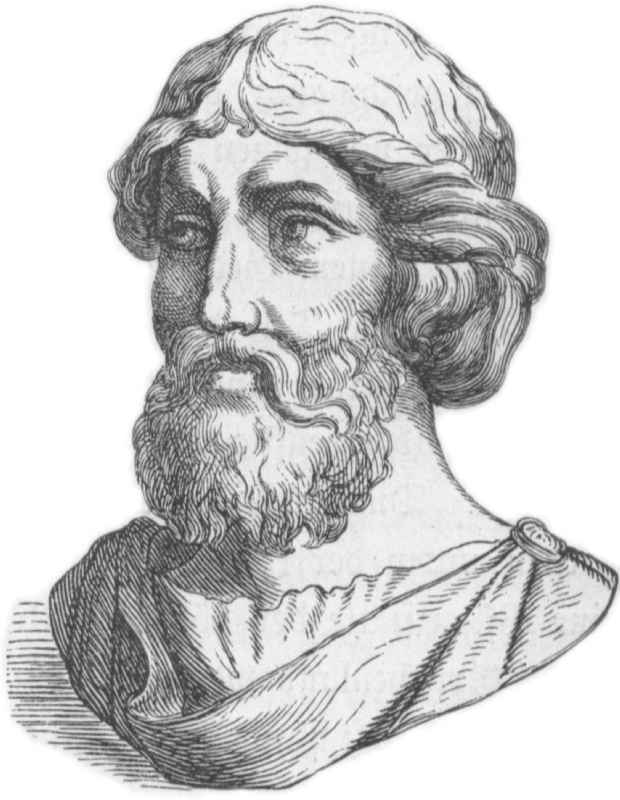 Pythagoras (Greek: Πυθαγόρας) was a Greek philosopher, mystic and mathematician. It's being told that have traveled to Egypt, Babylon and India. He took the knowledge from these communities back to Greece where he founded a Mystery in Croton, one of the Greek cities in Calabria, Italy. Here he found a protector and benefactor, Milo's richest man. Milos daughter Theano was Pythagoras' favorite student, later they were married. According Jamblikos, the last leader of the Syrian Neoplatonic school Evboia, Theano work with the golden mean. Daughter Damo must have been responsible for Pythagoras' surviving writings. The other two daughters, and Arignote Miyia, was also pythagoréere. It is difficult to determine which of the discoveries credited to him that really is his own, which should be attributed to other members of the school, and what he had learned during their long journeys. Pythagoras believed in reincarnation, and believed that the soul of man can also be reborn in an animal. His disciples in the highest ranks did not eat any meat or fish. Pythagoras himself was a vegetarian. Pythagoras recommended offerings of food to the gods, but rejected the specific blood sacrifice. He believed that the slaughter brings out the lowest instincts and desires of man, and thereby increases the likelihood of war and other violence between people. For him, the soul of a fallen deity, polluted by this world and trapped in the body like a grave, doomed to an eternal cycle of rebirths, but with the ability to free through ritual purification that would bring harmony between the soul and the world around it. He voiced the universal human experience of being a stranger in a world that is our element. Our collection contains 24 quotes who is written / told by Pythagoras. "Silence is better than unmeaning words"
"Do not say a little in many words but a great deal in a few"
"As soon as laws are necessary for men, they are no longer fit for freedom"
"Friends are as companions on a journey, who ought to aid each other to persevere in the road to a happier life"
"As long as man continues to be the ruthless destroyer of lower living beings he will never know health or peace. For as long as men massacre animals, they will kill each other"
"A thought is an idea in transit"
"There is geometry in the humming of the strings, there is music in the spacing of the spheres"
"The most momentous thing in human life is the art of winning the soul to good or evil"
"Strength of mind rests in sobriety; for this keeps your reason unclouded by passion"
"Begin thus from the first act, and proceed; and, in conclusion, at the ill which thou hast done, be troubled, and rejoice for the good"
"There is nothing so easy but that it becomes difficult when you do it reluctantly"
"Rest satisfied with doing well, and leave others to talk of you as they will"
"It is better wither to be silent, or to say things of more value than silence. Sooner throw a pearl at hazard than an idle or useless word; and do not say a little in many words, but a great deal in a few"
"Concern should drive us into action and not into a depression. No man is free who cannot control himself"
"Above the cloud with its shadow is the star with its light. Above all things reverence thyself"
"Reason is immortal, all else mortal"
"No one is free who has not obtained the empire of himself"
"There is a good principle which created order, light, and man, and an evil principle which created chaos, darkness, and woman"
"In this theater of man's life, it is reserved only for God and angels to be lookers-on"
"Above all things, reverence yourself"
"The oldest, shortest words - "yes" and "no" - are those which require the most thought"
"Choose rather to be strong of soul than strong of body"
"Do not talk a little on many subjects, but much on a few"